Located in the Northern Pastoral Sandy Region of the Ferlo Region in Senegal, the Kamb site covered about 25 sq km. The Ferlo’s climate is similar to much of the Sahel and characterized by two main seasons: a dry season that lasts nine months from October to June, and a rainy season of three months. Total annual rainfall is both low and highly variable, with an average of 422.6 mm per year from 1951–2004 (Ndiaye and others, 2014). Before the droughts of the 1970s and 1980s, this sylvo-pastoral area used to be covered with a relatively dense wooded savanna. Most local inhabitants confirmed this and attributed the loss of woody vegetation not only to overuse by humans but also to droughts, lack of rain, and unfavorable soils (Tappan and others, 2004). Once vegetation is lost, soils become susceptible to erosion. The sandy soil loses its structure and becomes more mobile, prone to wind erosion. 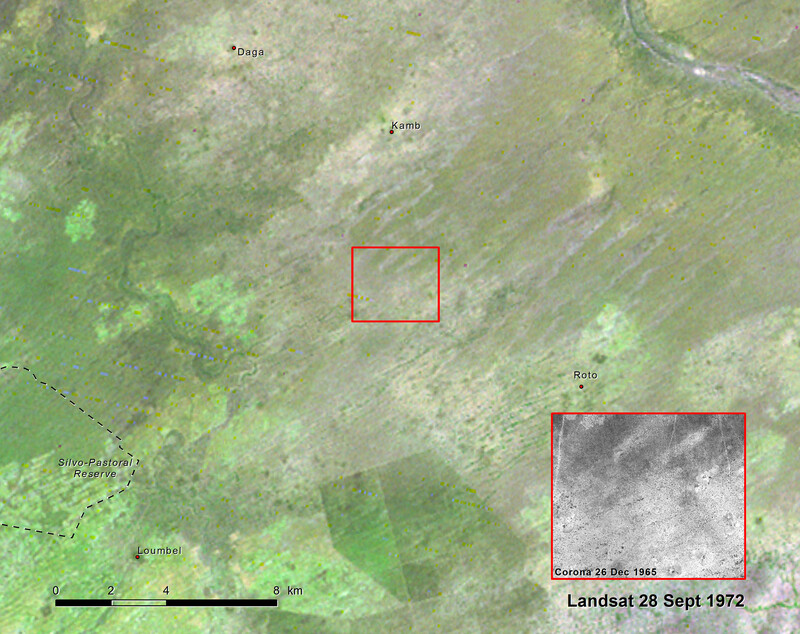 The 1972 satellite image confirms the loss of vegetation and the increase of degraded barren land subject to erosion in the Kamb area, shown in white patches on the image. One of the early fenced plantations can be seen 15 km south of Kamb to restore some degraded land. 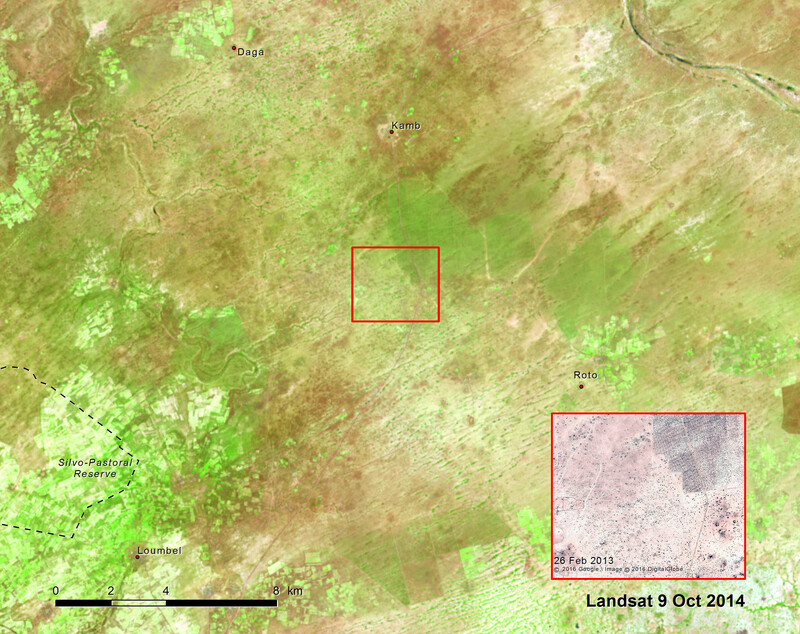 Recent high-resolution imagery shows significant re-greening south of Kamb. Supported by several afforestation projects, thousands of Acacia senegal (gum arabic tree) have been planted in large fenced areas, which in some cases are partly used for harvesting by the responsible village. Herders are allowed to graze livestock at the end of the dry season for a fee, which is used to maintain the protected area (Brandt, 2015). Even though the 2013 image shows a positive impact on the land from the re-greening resulting from tree planting, it does not translate directly into a positive picture of ecological recovery. The planted trees create a large monoculture, which lacks diversity. Fauna and flora biodiversity is much lower than it was before the degradation of the wooded savanna, and the population still speak of soil erosion and a lower water table.